Finally got my order from Shapeways. Behold! 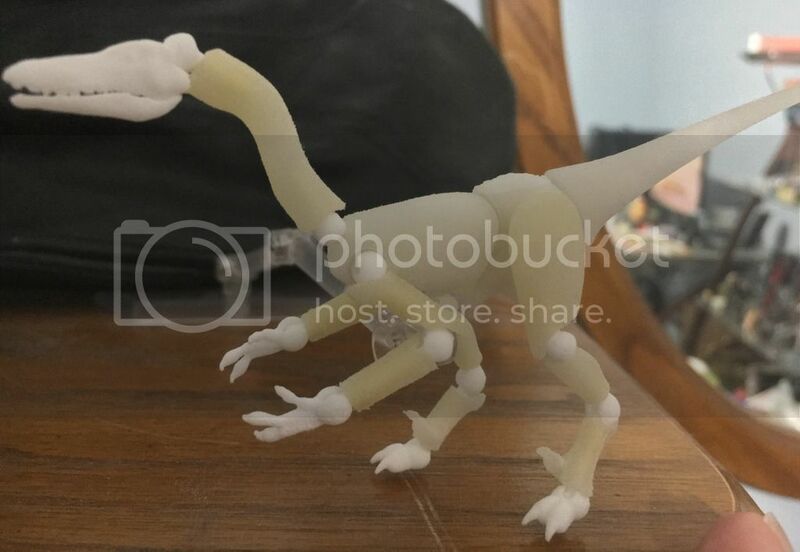 A 1:12 scale articulated Velociraptor figure prototype! The white parts are 3D printed nylon ('White Strong Flexible' on Shapeways) and the ivory-colored stuff is a soft, rubbery 3D printed plastic ('Elastoplastic'). Joints are ball-sockets with an outer diameter of approx. 5mm and are a royal pain in the rear to assemble. Keep in mind that this is a prototype and that a feathered version is in the works as we speak. Also, yes, the sickle claws are a bit small. That'll be fixed. The chest has a 3mm peg hole for mounting onto a Figma stand. I'll come up with my own later. That looks great, congrats Papi-Anon! Will the feathers be sculpted on or are you going to put a soft "skin" around the armature? Thanks! The feathered version will be a new print for all the parts affected (even the hands) that I'm modifying in CAD. I already have the chest, hips, tail and head redone with feathers in CAD. The tail will be similar to David Silvas's Beasts of the Mesozoic tail designs, basically a feathered, straightened version of a squirrel tail minus the bendy-wire. So tried my hand at a human head sculpt in CAD. I based this Neanderthal design on some of the more recent reconstructions but some things still seem...off about it. Maybe I'm missing some of the more subtle differences between Homo neanderthalensis and H. sapiens, but the front and side planes of the head seem a little flat. It's creating a somewhat boxy look, with a too-sharp vertical edge running down the temple, cheek, and side of the chin; rather than a more subtle curve in that area and over the whole facial plane. The flatness also seems to bring parts like the cheeks and corners of the mouth too far forward, which I think is making the upper lip, nasolabial groove, and nasofacial angle (phew) seem a little sunken. But it's looking good I like the shape of the nose you've got there. Just needs that couple of overall tweaks, IMO; which should be no trouble, looking at this whole thread. Thanks for the advice! Yeah, it does look too flat now that I get a look at it. This will have long hair to the sides which is partly why the sides of the head are flat, and I'll try to touch up the too-full cheeks by shaving off some mass to get the more like the look reconstructed Neanderthal faces tend to have. The nose I'm proud of, thanks! I wanted a long but broad nose that looked 'human' yet at the same time unusual in contrast to most noses of our species. So a mini-update. Working on a grey wolf figure, but scaling it up slightly could get it to be a dire wolf I guess? Anyways, WIP, still needs fur texture and limbs and such. Wow! This is cool stuff! Will you show us a painted prototype as well? I'll show it as soon as I have the cash to spare for printing it. So cool! I find the construction of action figures fascinating. I'm really looking forward to see how these turn out! So an update (albeit not the more cheery of them)! Wolf print was a DISASTER, and at no fault but my own. I overestimated WSF's flexibility and strength and long-story-short the wolf parts either didn't fit or snapped from forcing them to fit. A few things DID succeed however. The type of pronged ball-socket joints used for the hips works quite well and the slit holes for allow flexibility for pegs to fit snuggly into worked too. Rigt now I have a test-print of a more standardized version of the ball-sockets en-route that will help me out tremendously in future figures. 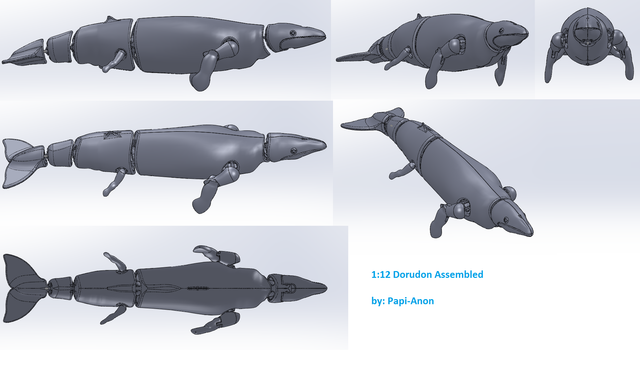 The past several months I've been working full-time as a draftsman but have spent free-time on a fun project: an articulated 1/12 scale Dorudon. I fear the head might be too much like a baleen whale ancestor but my goal was to replicate the Dorudons from WWB to some degree. Hind legs are only articulated at the hips with ball-joints, forearms have elbow articulation and double-ball sockets for shoulders (the arms might be too beefy? ), and the body has double-ball sockets at every section it's articulated at (save the jaw). 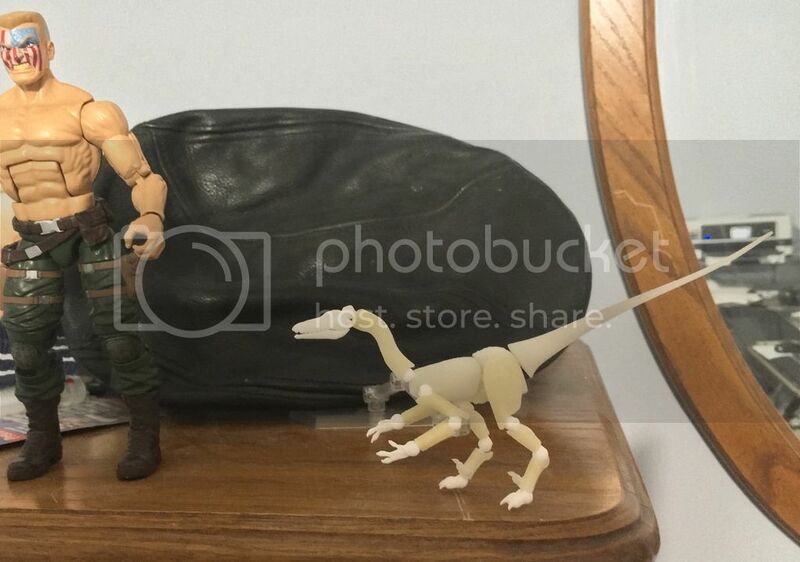 Archeocetes get so little love in figure form, though recently we have been given the 20" Basilosaurus display figure by PNSO and Collecta this year has given us a figurine of Baz as well. Dorudon was a very interesting animal. Do you think it had that prominent of a tail fluke? Do you think it had that prominent of a tail fluke? Petsonally, I think so to a degree. Basilosaurus preyed on them but wasn't built for diving, so it would make sense for Dorudon to have a better fluke for trying to dive down and away from its top predator. That's my interpretation based on what I've read, anyways. So I finally got around to reverse-engineering the 3D Mesh scan of Andrewsarchus's skull to try and create an 'idealized' upper jaw with complete teeth and bilateral symmetry. Still need to get the remaining teeth done and then mirror the right side. I've never seen the holotype or any of the copies that exist in-person so I took some liberties in my ignorance such as the nasal septum (if this is incorrect LET ME KNOW so I can get rid of it). 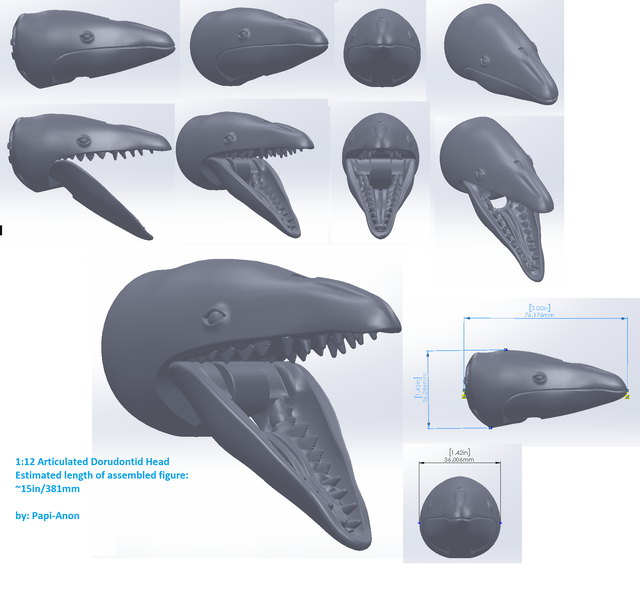 Once completed I'll be working on a hypothetical lower jaw based on previous restorations others have proposed and make it articulated for 3D printing. Is the final result going to be a bare skull like this or a fully fleshed out figure? The end result will be articulated jaws. I attempted a fleshed-out figure a while back but may have to redo it using this for the base in the design. I’d actually like to make three skeletons: one based on the outdated mesonychid design, one of the mostly entelodont design, and one of the hippo-like design some have done (thick hoofed legs and mostly hairless). Well as you might have guessed, I'd be interested in any and all of these! I'd love to see the original in NY someday. I'd love to see the original in NY someday. Same here. I don't have an actual Bucket List but seeing ol' Andy in-person is something I'd love to do at least once in my life. That and the first Big Al in Wyoming. And in case anyone hadn't figured it out yet, the idealized skull of Andrewsarchus will be 1:12 scale when completed. Should I get to the skeletons they'll be as well. Teeth are more or less done. Only so much I could make out of the few images of the underside of the jaw, but all in all I'm satisfied for now. The STL model checks out on Shapeways for regular nylon, premium nylon, frosted ultra & extreme, HP nylon, and Hi-Def Acrylate so that's music to my ears (and much cheaper than the old 3D scan mesh file I had printed a year ago). After some touching up of details here and there I'll move on next to my idea of the lower jaw. One model of the complete skull will be fixed and another modified for hinged jaw articulation.